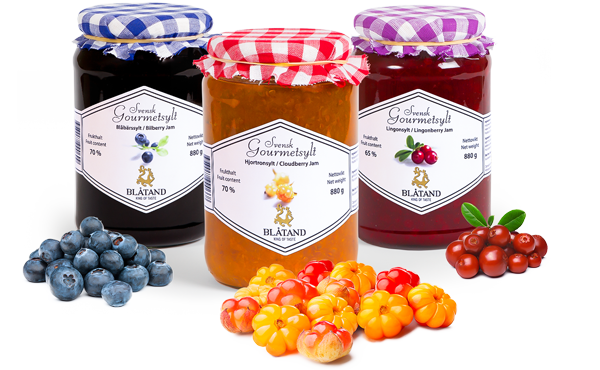 Blåtand supplies caterers, wholesalers and restaurants with Sweden’s best jams and frozen berries with high standards of shape, flavour and colour. Products with a high berry content, whole berries and a reliable consistency are our hallmark. Swedish gourmet jams from Blåtand are for those who value whole berries and a perfect consistency. Lingonberry, bilberry and cloudberry jams with whole berries and a 40-70% berry content are carefully prepared to traditional Swedish recipes and ideal for caterers and restaurants looking for natural flavours of high quality. We also make jams to custom recipes on request and produce jams for private labels. Blåtand’s carefully selected and individually frozen berries are of the highest quality and appreciated by customers with a taste for the best Mother Nature has to offer – bilberries, lingonberries and cloudberries from the wilds of Sweden. All Blåtand’s products are quality-assured in accordance with the international food safety standard ISO 22000. Cloudberry, lingonberry, bilberry and wild raspberry jam in glass jars with fabric covers. Pack sizes: 120 g, 210 g, 380 g and 880 g.
Cloudberry, lingonberry and bilberry jam in glass jars with fabric covers. Pack sizes: 3 x 120 g.
Blåtand gift pack in cardboard sleeve, 2-pack. Cloudberry and lingonberry jam in glass jars with fabric covers. Pack sizes: 2 x 210 g.
Blåtand jam classics in wooden case, 3-pack. Pack sizes: 3 x 210 g.
Blåtand gift pack in clear plastic case, 4-pack. Pack sizes: 4 x 210 g.
Lingonberry jam in plastic tubs. Pack sizes: 1 kg, 2 kg, 4.5 kg, 5 kg and 12 kg. Lingonberry, bilberry, bilberry & raspberry, raspberry and strawberry jam in plastic tubs. Individually frozen wild Swedish berries. Lingonberries and bilberries, individually frozen, carefully cleaned and sorted, packed in cartons. Lingonberries and bilberries, individually frozen, carefully cleaned and sorted, packed in sacks. Pack sizes: 10 kg and 25 kg. Cloudberries, individually frozen, carefully cleaned and sorted, packed in tubs/blocks.